There are many elusive people amongst my mother's ancestors, but the one who particularly drives me crazy is my great-grandfather George Cockram. Several years ago, my mother casually mentioned that technically her maiden name wasn't really Smith - her grandfather had changed it to Smith from 'something like Cochrane'. Up until then, I thought I belonged to a huge family of Smiths - suddenly it was whole new ball game. 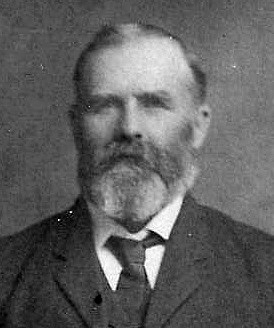 To put George Cockram's story in a nutshell, he was born in Devon, UK in 1851, and when he was 24 years old, he married Louisa Murphy and migrated to Canada. But he did so with a new name - Thomas Smith. For the rest of his long life, he was known by that name, or as George Thomas Smith or Thomas George Smith - the name Cockram had well and truly been banished from his life. Of course the obvious question is WHY? Did he rob a bank or do someone in? Did he have several strapping wenches pursuing him? Did he have an altercation with his parents or his brothers? So far, I haven't found a glimmer of an answer. It's easy to assume that he must have been hiding from someone or something. But so far I've found no evidence of any wrong-doing by him or anyone else in his family, and judging by what I've learned of his later life as a farmer in Saskatchewan, he was a highly moral man who was well loved by his family and respected by his community. Perhaps he made amends for whatever it was in his past that made him change his name. His secret seems to have gone to his grave with him - but I'm still hopeful that somewhere out there I'll eventually find it, or at least come up with a probable explanation. I'll use this blog to write about what I know of George's life and share my progress in solving his mystery, as well as those of other ancestors. I hope you'll come along for the ride - and if you have any comments, insights or suggestions for me, I'd love to hear them. What a strange story, why would anybody change their name from a respectable Cockram to a generic name like Smith.There must have been a reason. I will watch this blog with interest and hope that it results in something startling, shocking, and very unusual. George comes back... or does he? Was Louisa really a Murphy? Oops, where did George go?